Sara Magalli sent in this one. "This is a picture taken from our free day at Disneyworld. I spent the day with my three best Glassmen friends (left to right): Jonathan, Dan and Chris at the end. 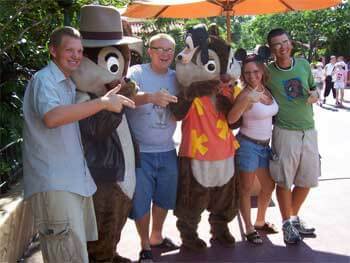 You will notice how Chip (or maybe it's Dale) stole Chris' "Goofy hat" for this photo op! "All four of us marched in the trumpet line, and even though we were all returning members, it was this summer that we became great friends. This picture makes me remember all of the fun and laughs we shared and how much better my ageout year was as a result of having the friendship of these three great guys." Thanks Sara! E-mail your best shots from the summer to dave@dci.org along with where and when the photo was taken. Send some biographical information about yourself as well. We'll give you full credit. Also, let us know if you want your e-mail address included.